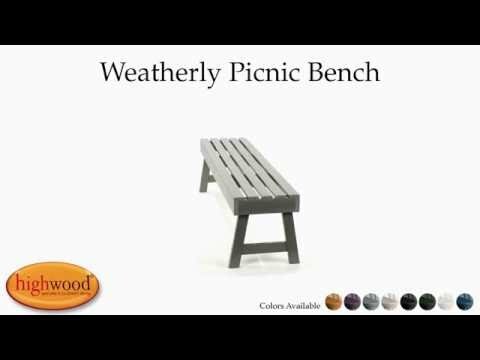 This Weatherly Picnic Bench is part of the Weatherly Collection and comes in 4ft and 5ft widths and looks great when positioned against a wall where space is limited, or free-standing as a focal point. The 5ft version can also be used as a dining bench with our 36in x 72in rectangular dining table. This product has been load tested, per ASTM 1561-03 (2008) standard for Outdoor plastic furniture, and has a 500-pound weight capacity. Some assembly is required (see assembly guide). Very comfy. Materials appear to be of high quality. It was easy to assemble and the tool that was provided worked perfectly and all holes were aligned. It doesn't get burning hot in the sun which is a plus since it's black and I worried about that. The color is gorgeous. And the style is classic. The assembly was straight forward, only 8 screws and your done. The screws were difficult to tighten, and the bench rocks side to side easily once assembled. Tried tightening the screws and they are as tight as they can go. I can’t imagine it can withstand 500 pounds, like it says in the details. I’m not a fan of the exposed screws for the price. Like colored plygs would make it better to hide the screws. The cross bars on the legs are just pin nailed, that surprised me. It feels and looks like wood, not plastic. It says it’s from recycled plastic, so I thought it would be more like a Trex product. I am going to use it outside across from our outdoor shower, for setting beach bags on and /or sit for a minute to dry off. It hasa12 year warranty, so that’s encouraging.